An encouraging article by Dan Hurley in the Washington Post describes the clinical trials of the first ever drugs to improve learning and memory in those with Down syndrome, conducted by Dr Alberto Costa and Dr William Mobley. Enthusiasm is spreading througout the research community that Down syndrome, once considered too complex to treat, and abandoned by researchers, is now the subject of clinical trials. “A lot of us are well aware of progress we’ve seen . . . in the past five to 10 years,” said Jamie Edgin, a developmental psychologist at the University of Arizona in Tucson. Among those advances, she said, are tests designed to measure the cognitive abilities of people with Down syndrome. The development of mice with the genetic equivalent of Down syndrome, essential for studies of possible drug treatments, has been another milestone. “There’s a lot of excitement,” Edgin said. It is a devastating irony that stunning advances in accuracy in prenatal testing AND the first clinical trials for medicine to treat cognitive impairment of Down syndrome are discovered concurrently. Sadder still is the fact that the prenatal testing is receiving vastly more press coverage. Imagine the excitement in the press if a new cancer drug were discovered?! Well, this is how the families of over 400,000 Americans who have Down syndrome feel about this drug and its potential to change lives. Not only can it help my ten year old daughter communicate with her classmates, but it may help insure that she has more classmates who look like her. Maybe, just maybe, if mothers who are told that their unborn baby has Down syndrome heard that there are amazing advances in treatment for the cognitive delays in Down syndrome, they would not despair of their child’s potential for a happy and fulfilling life as stated in this article. Of course, we who love our children with ‘designer genes’ already know their lives are wonderfully rich, full of love and learning, and giving back to their community. But if it takes more hope to help bring such gifted people to birth, then we want to be the first to spread the word. Thank you WaPo for joining us in our efforts to spread the good news. 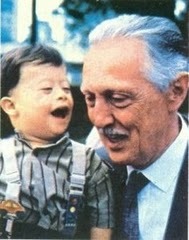 This entry was posted in Down Syndrome, ProLife, Resources by t garcia. Bookmark the permalink.